The offences happened in June 2016, at his home in Plains, North Lanarkshire. Gorman was found guilty of three charges under the Animal Health and Welfare (Scotland) Act at a hearing in September. 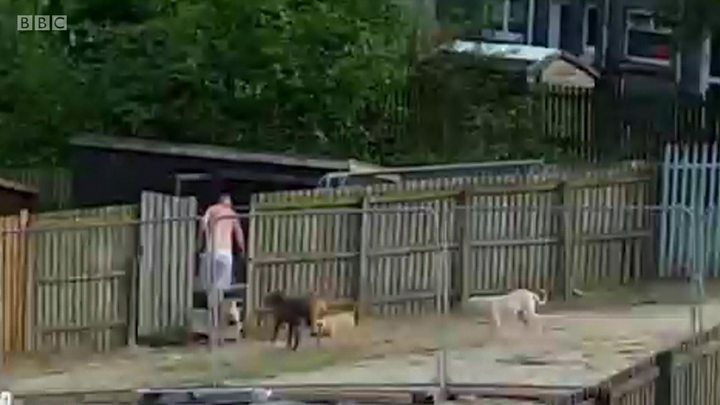 Sara Shaw, head of the wildlife and environmental crime unit, said: "This was a case of widespread and indiscriminate neglect and the dogs in Gorman's care were caused terrible and unnecessary suffering with Gorman failing to provide them with a suitable environment or adequate care. "We expect the highest standards of commercial dog breeders and are committed to working with the Scottish SPCA and the police to ensure that those who do not meet these standards are held to account." Gorman had been banned from keeping animals for 10 years at a court hearing relating to another case in July. He is also subject to a six-month restriction of liberty order relating to that case. An undercover Scottish SPCA Inspector said Gorman had a "long history" of maltreating dogs in his care. "This case has highlighted his ongoing cruelty and we're delighted that he has been dealt with by the courts", he said. "The mastiff-type puppies were suffering from parvo virus which is an excruciatingly debilitating illness which can, in some cases, result in death. "To not seek veterinary treatment for these pups despite their obvious distress shows Gorman's priorities lay entirely in the profit that could be gained from selling on puppies to naive new owners, rather than in the welfare of the dogs."